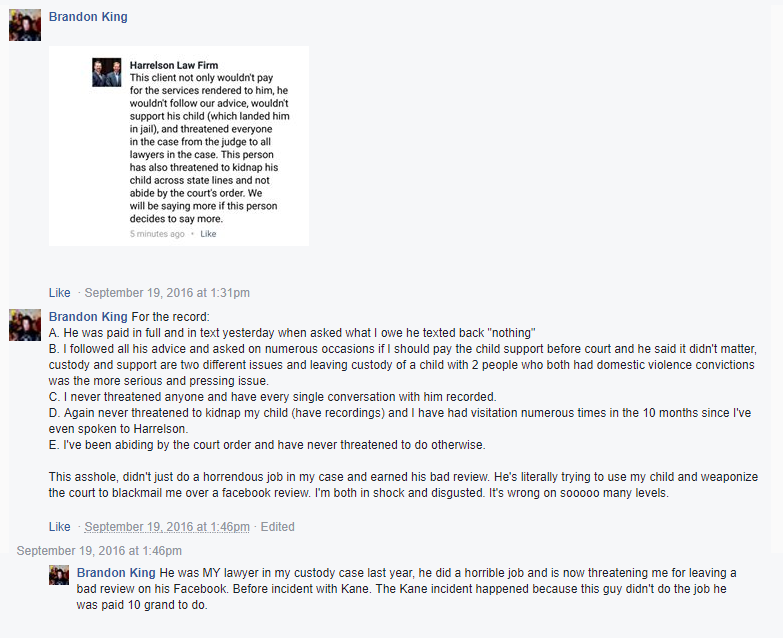 Last month Brandon King filed a bar complaint against the lawyer who was unlucky enough to become involved in his ill advised custody lawsuit. It's part of the current harassment campaign being conducted by Brandon and his boss, Vinnie Leonelli-Spina as was Brandon's harassment charges filed against myself and Bullyville in Texas and Vinnie's harassment charges against me filed in New Jersey. Custody battles are never a good thing for anyone involved but it's the children who suffer the most. It's pretty impossible to get the feuding parents to see how destructive their self-centeredness and possessiveness is to the child they're fighting over. 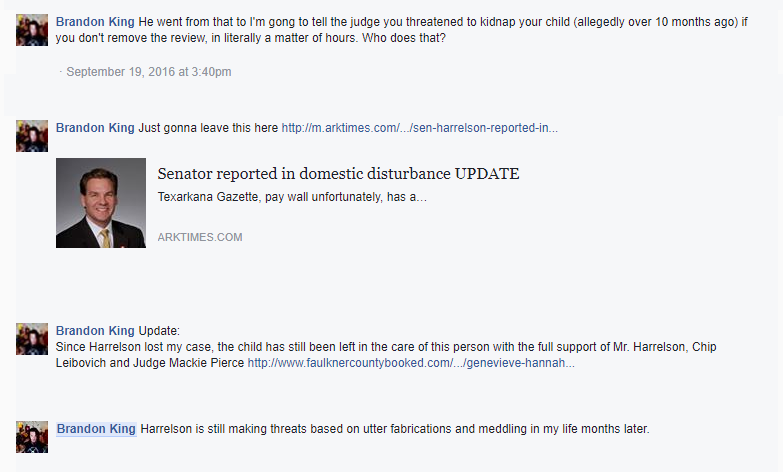 For some reason Brandon thinks everyone involved in his custody case has been mean and unfair to him; consequently, he has blamed everyone involved in the case except himself. 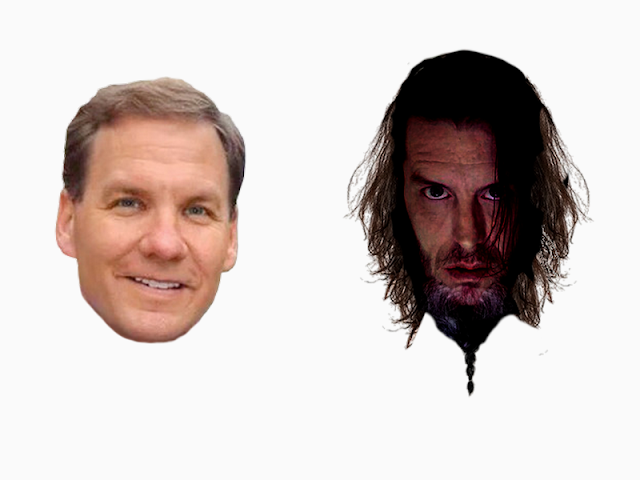 He's gone after the judge, the opposing lawyer and his own lawyer. For Brandon, a convicted drug dealer who was $25,000 behind on his child support, to blame his attorney is pretty funny. Steve Harrelson is a former state congressman who served as Speaker of the Arkansas House of Representative. He's also licensed to practice law in 3 states. Harrelson quit as Brandon's attorney in August of 2016 stating an underlying conflict of interest. Brandon's boss, Vinnie Leonelli-Spina who was posing as Brandon's boss and attorney using the name Toni Mollica was supposed to be paying Brandon's legal fees but wasn't keeping up in a timely manner. 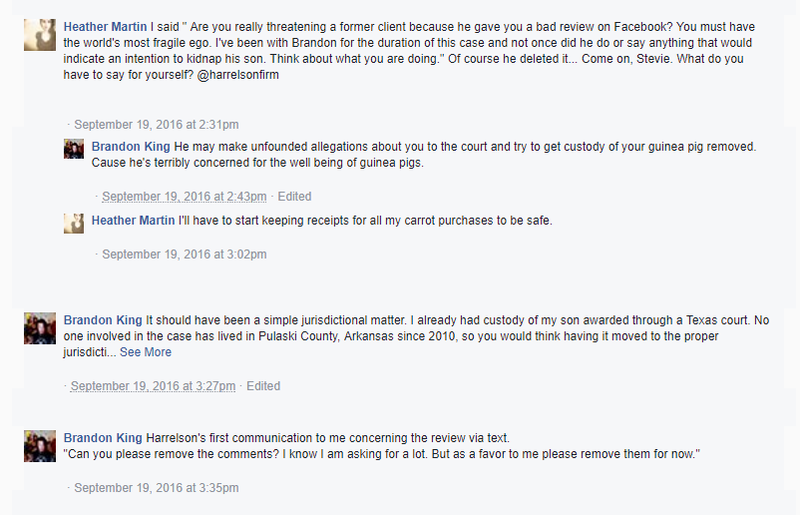 As soon as Brandon learned that Harrelson has asked to be removed from his custody case Brandon left the comments below on the Harrelson Law Firm's facebook page. What I found interesting was that Brandon states his attorney-which would be Toni Mollica- was listening in on Brandon's conversations with Harrelson. At the bottom of the comments you'll see some from April of this year. That's because in March of 2017, in connection with an investigation into Vinnie Leonelli-Spina, Steve Harrelson signed an affidavit stating that he believed Vinnie Leonelli-Spina and Toni Mollica were the same person. Naturally that got Vinnie and Brandon upset which resulted in more harassment including the bar complaint.